Aboard a whale watching tour with Whale Watch Kaikoura off the South Island of New Zealand, we were lucky to capture this close up picture of the tail on a Sperm Whale. On a foggy day out on the rolling waters off Kaikoura on the South Island of New Zealand with Whale Watch Kaikoura, a Sperm Whale shows passengers the beauty of its tail. As the Sperm Whale prepares for a deep dive, where it can go to depths of 3,000 meters, the last part of the whale to be seen is its massive tail. The average dive for a Sperm Whale is around 400 meters where it will stay beneath the surface for a 30 to 45 minute period. When the whale resurfaces, it will spout around on the surface for an average of eight minutes. 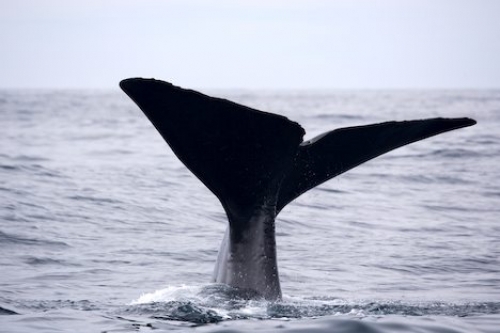 Once again, it will prepare for a deep dive to go to great depths to feed on giant squid, sharks or bottom dwelling fish, giving passengers aboard Whale Watch Kaikoura a chance for a beautiful tail picture. Each fluke on the tail grows in a triangular shape, usually reaching a width of between 4 to 4.5 meters. In the lighting of this picture, the indentations and scars on the tail are clearly visible as the whale disappears. Each Sperm Whale seen around Kaikoura is identified by researchers by observing their contour traits on their tail flukes and dorsal fins. Photo of the tail on a Sperm Whale in the waters off Kaikoura, New Zealand while on a tour with Whale Watch Kaikoura. The coastal waters off Kaikoura, New Zealand is one of the best locations to see Sperm Whales in their natural habitat. On the excursion with Whale Watch Kaikoura, keep your eyes peeled for other wildlife such as Hector's Dolphins, New Zealand Fur Seals, Albatross, seabirds and possibly Humpback Whales, Pilot Whales, Blue Whales, Killer Whales or Southern Right Whales depending on the time of year. Sperm Whale seen during a whale watching excursion with Whale Watch Kaikoura, Kaikoura, South Island, New Zealand.